Warren Kelley, John Long, Phil Gillen, and Rachel Botchan in The Property. Photo by Hunter Canning. BOTTOM LINE: With a good foundation but in need of some renovations, The Property explores dysfunctional relationships as a woman juggles the needs of her son, his father, her current lover, and her tenant. Relationships are far from easy, whether they are romantic, platonic or familial. A myriad of situations can also complicate matters—say, if you are no longer involved with the father of your child, or you hate your mom's boyfriend, or when it is based around a transaction, such as landlord and tenant. Ben Josephson's The Property examines some of these dysfunctional connections. In director Robert Kalfin's staging, it's a fixer-upper, but it has good bones. Caitlynn Barrett's scenic design creates a Sims-video game feel, with free-standing doorways, and a floating piece of molding next to a simple window. Add some functional-looking plush furniture and a white picket fence and you get the sense of a romantic comedy brewing as Sinatra's version of "The Lady is a Tramp" plays. This home belongs to Irene (Rachel Botchan), mother of Todd (Phil Gillen). Irene dumped Todd's father Vernon (Sam Tsoutsouvas) years ago, due to his infidelities. Since then, she has shacked up with Eddie (Warren Kelley). Each character is ridiculous in their own way. Irene doesn't know what she wants and Eddie is a blithering fool, trying to get the others to argue with him over politics and finances. Todd is an angsty teenager, who turns to writing to help him cope with his emotions. Irene wants to give Todd some momentum in life, and orders Vernon to pull strings at his company as she envisions Todd climbing the corporate ladder. We are also introduced to Greg (John Long), a teacher for troubled youth, who proceeds to rent Irene's spare cottage. 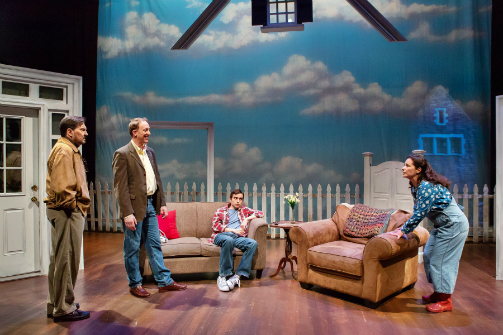 The play's four scenes cover the span of two years as each character seeks to find meaning and comfort in their relationships. Writer Josephson uses heightened language in The Property, a risky move. This play is set at the start of the 21st century, yet these characters seemed to have stepped out of another era with lines like, “High up into those echelons where our oppressors conspire.” It is far too easy to zone out during the script's long monologues. There are comedic moments that recapture our attention, but unfortunately when the action switches back to drama, it's difficult to be invested. The Property tries to fit too many themes into a single story. These characters say so much, but don't listen to each other, or maybe they just don't care, and that made me not care much either. Perhaps if the production had stayed with the original rom-com feel instead of transitioning to more of a soap opera, it would have been more successful. The Property is by Ben Josephson. Directed by Robert Kalfin. Scenic & Prop Design is by Caitlynn Barrett. Costume Design is by Gail Cooper-Hecht. Lighting Design is by Paul Hudson. Sound & Projection Design is by Andy Evan Cohen. Stage Manager is Craig M. Rosenthal. The cast is Rachel Botchan, Phil Gillen, Warren Kelley, John Long, Sam Tsoutsouvas, and Matthew ZanFagna.